This evening I was in the mood for chili, even though our temperature here is still ridiculously hot. I simply turned down the air conditioning and made it feel like Fall inside while we ate! 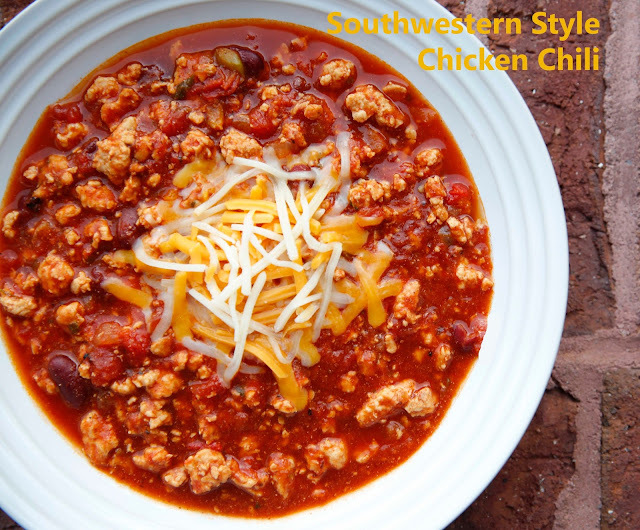 LOL I stopped by Sprouts Farmers Market on my way home and decided to make Southwestern Style Chicken Chili using ground chicken breast and fresh Southwestern Style Chicken Sausage (made fresh at Sprouts). The sausage was bulk style (not in casings) and had diced jalapeno, onion and garlic in it. The chili turned out absolutely amazing. The ground chicken breast becomes so tender when it simmers in the acidic tomato base. I only simmered it for about 30 minutes after everything was cooked. I like to use fire roasted tomatoes for extra flavor but you can use regular diced or crushed tomatoes if you prefer. 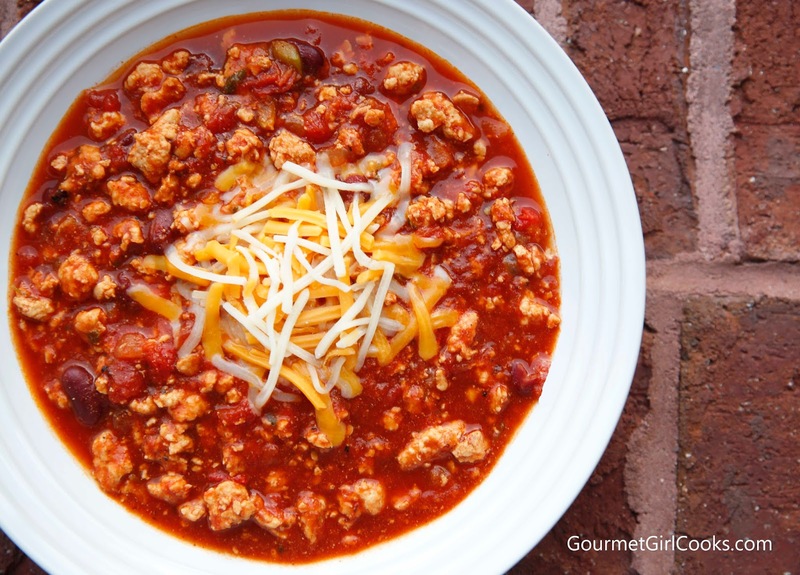 The chili was moderately spicy but you can tone it down or add more heat if you prefer. I served the chili topped with Sargento's 4 State Shredded Cheddar, a blend of 4 different cheddars. It's one of my favorites. We also added a little dollop of sour cream to our bowls. I served the chili with mini Cheddar-Black Pepper Biscuits made with Cabot's Artisan Reserve 3-Year Aged Sharp White Vermont Cheddar that I shredded by hand. They were tender little biscuits that carry big cheddar flavor. I snapped a couple photos of the chili below and included the easy peasy recipe. Enjoy! In a large stockpot over medium heat, add oil and saute onion, sweet bell peppers, and jalapeno peppers until almost tender; add minced garlic and cook approximately 2 to 3 more minutes, stirring frequently (cover the pan to help speed up cooking time). 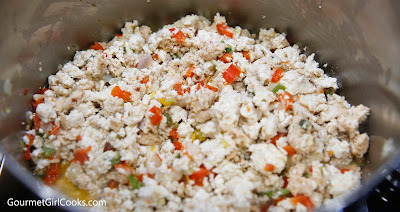 In the same pan, add ground chicken and chicken sausage; cook, breaking up with a large spoon, until chicken is no longer pink. Add all of the spices, tomatoes, tomato paste, chicken stock and water. Add optional beans, if using. Bring to a medium boil; taste to adjust seasoning, if necessary. Cover pot and reduce heat to low, Simmer on low for approximately 30 minutes (if desired, chili can be placed in a crock-pot and cooked on low for approximately 8 hours instead of cooking on stove top). Ladle chili into bowls and top with shredded cheddar cheese and dollop of sour cream, if desired. This chili looks wonderful! Just in time for fall ... love how you "created" your own personal autumn atmosphere. :-) We've had very pleasant "fall-like" weather the past few days. We'll be getting hotter weather again before it cools down for good, but the "hints" are nice and very welcome! Our trees haven't begun to turn yet ... well maybe a few "tinges" here and there if you look closely. Sometimes they begin turning in mid-August. Depends on the year, I suppose. Apple Cinnamon Walnut Muffins - Happy Fall Y'all!